Photo: Vietnam has plenty of statues. Ben Tre, the capital of the same-named province, is made up of three main islands wedged between the Tien Giang River to the north and to Co Chien River to the south with the Ham Luong River running straight down the centre. All are effectively offshoots of the Mekong River as it splits out into many fingers before spilling out into the South China Sea. Famous for its coconut desserts, the province is not surprisingly covered in coconut trees. During the war these coconut trees were used to make coconut oil which was then used as a valuable substitute for kerosene. Verdant and flat, the province is mostly given over to rice and fruit cultivation, though being an island province, fishing is another mainstay of the local economy. Traditional Mekong life is the norm here and it’s a very unadulterated scene—wandering the market, sipping the coffee, doing a boat trip and skipping through the local museum are the main pastimes. In the past, Ben Tre was a dead-end province, as, unless you had your own transport, you needed to turn around and head back through My Tho to get any further into the Delta. New bridges have put an end to that, and you can easily travel from My Tho to Ben Tre and then onwards to say Tra Vinh for example, with no need to backtrack. So how to fill your time in Ben Tre? For starters you can do boat trips from here for less than at My Tho and, with its large network of minor canals, there’s a lot of scope for riverine exploration. There’s also a small but interesting museum and a pleasing riverfront worth investigating. Ben Tre market is an excellent example of a typical Vietnamese wet market and early morning wanderers will find oodles of fresh produce, meat under lights and fish under water and the riverfront section has a large range of fresh fruit and cut flowers. You’ll find a large selection of pig heads and trotters near the riverside entrance should you be needing some pork. All up it is very photogenic. Also worth a wander through in the An Hoi Community House, the original building dates back to 1895 with additions through to 1955. You’ll find it in the centre of town on Nguyen Dinh Chieu, on your right from the main roundabout with the bridge behind you. Those with somewhat limited time could make do with a single night here, doing a boat trip in the morning and visiting the museum in the afternoon, but if you have more time, give it two nights and plonk yourself down in a homestay by a canal and just soak it up. 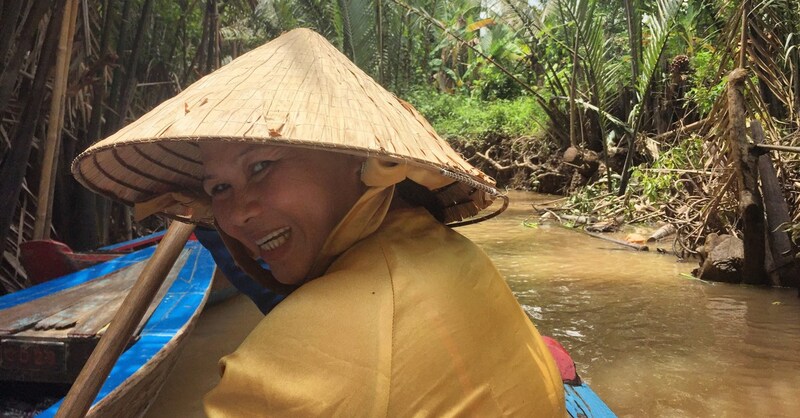 If you’re on a budget and just looking for a brief taste of the Mekong Delta area, Ben Tre is arguably a better base than My Tho, especially if you opt for a homestay experience. Overall it is a pleasant enough place, with a small town charm, and makes for an allround reasonable spot for those with enough time on their hands to dawdle slowly through the Delta. If you do have your own transport, Ben Tre is a good one for just hoping on the bike and going for a ride. Grand and flat with plenty of rice fields to go around, this is a very beautiful pocket of the Delta. Even by Mekong Delta standards, Ben Tre stands out for its verdant beauty, with rice cultivation going on all over the place. From Ben Tre town, cross the river and head east and—just keep going. The further you go the prettier it gets and the roads are pretty good and little trafficked. While you’ll need a motorbike to get far, even the immediate surrounds are worth exploring by bicycle. Most accommodation in town should be able to hire you a scooter or bicycle. Most of the action in Ben Tre happens within the confines of Hung Vuong and Hai Ba Trung from south to north and Ngo Quyen and Nguyen Hue from west to east. Traffic can be manic here as the roads are smaller than neighbouring My Tho, mainly around the market. Hung Vuong especially due to fruit and vegetable sellers parking their wares on the street. You will find ATMs dotted around town. We couldn’t find a dedicated internet cafe in the area however all accommodation we visited offered free WiFi as a standard amenity. Do be aware that if you decide to to stay in a homestay, Ben Tre town will be at least a twenty minute bicycle ride away, so if you’re more of a town person, who likes crawls coffee shops and markets, staying in town may be a better bet. Otherwise, we recommend going for a homestay. Please sign up as a Travelfish member to download the Ben Tre guide PDF (5.3 MB, 23 pages). Membership costs just A$35 per year (less than A$1 per week) and gives you access to over 250 PDF guides. Last updated on 30th September, 2018. Browse our independent reviews of places to stay in and around Ben Tre. Read up on where to eat on Ben Tre. Check out our listings of things to do in and around Ben Tre. Read up on how to get to Ben Tre, or book your transport online with Baolau. Planning on riding a scooter in Ben Tre? Please read this. Use the above map to find specific destinations in and around Ben Tre which are listed on Travelfish. Bed icons indicate a guesthouse, hostel or hotel, the knife and fork is an eatery or bar and the four-way circular thingy marks sights, attractions and other points of interest. Click on any icon for a short pop-up and a direct link to the page for that spot. If you are in the area, use the teardrop icon near the top left to show your position on the map (you'll need to allow position sharing for this last feature to work).